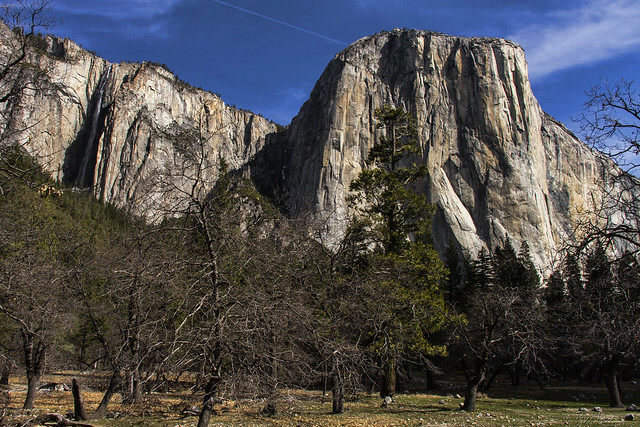 Rising more than 3,000 feet above the Valley floor, El Capitan is the largest monolith of granite in the world. It was visible—but not very noticeable—on the left in yesterday's post. But that take-your-breath-away moment doesn't come until you're down on the valley floor. Once again, coming around a corner does the trick, revealing this massive, towering hunk of granite. 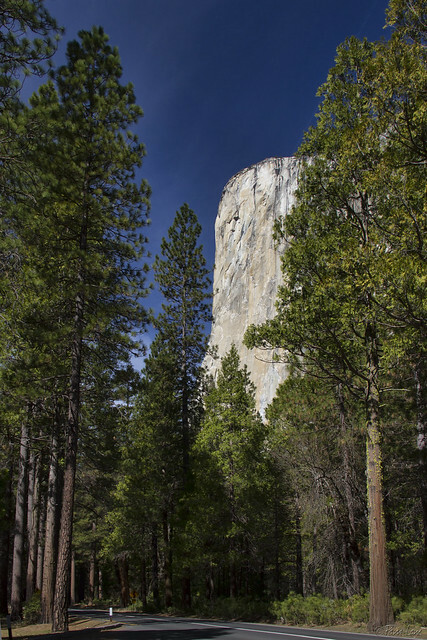 From across the meadow (above), you see El Capitan's southwest wall, one of many popular rock-climbing locations. On the far left, you can see Ribbon Fall, hidden in the shadows. El Capitan was once considered impossible to climb. The Nose (right) was the first section to be climbed, in 1958. The climb took 47 days. In contrast, the current "speed climbing" record is just under 2.5 hours. That would be quite a different kind of take-your-breath-away moment!